DatacenterDynamics has taken steps to introduce alternatives to traditional work processes and practices that reduce the impact on the environment. DCD ensure we support the environment by following strict policies in regards to waste and recycling, energy efficiency, business travel and water resources. Our general waste has been handed by London Waste, part of North London Waste Authority, whose aim to deliver waste as from landfill as efficiently and responsibly as possible. Our goal is to reduce the amount of office waste by recycling 50% of the waste arising by the end of 2015, and reduce our paper consumption by 10% relative to 2013/2014. Maintain data of all waste from each office. Maintain a “bin less” environment. No desk bins will be provided. General waste can only be placed in the communal general waste bins. Provide facilities to recycle waste paper, cardboard, plastic, glass, toner cartridges, and cans. Ensure staff, suppliers and contractors minimise the volume of packaging used and recover and recycle packaging where practicable. Process all waste in accordance with legal requirements and best practice. Investigate enhancing current waste management facilities in all DCD offices to improve recycling levels. To reduce the use of paper. To ensure all printing and photocopying is double-sided. Purchase only what is needed. Use available recycling facilities effectively to minimise waste. Encourage suppliers to minimise volumes of paper and packaging used or, where possible, use packaging that can be returned to the supplier for re-use, where there are environmental gains to do so. Re-use envelopes and packaging where practical and recycle where not. 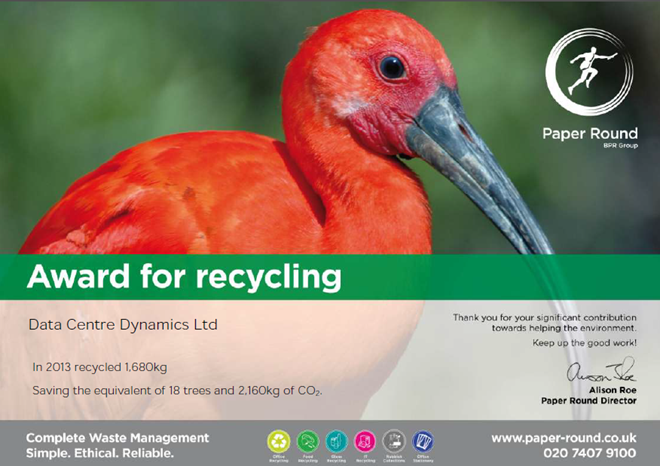 DCD works closely with Paper Round BPR Group who records amounts of paper recycled and provides us with the annual reports with information in regards to meeting recycling goals. In 2014 DCD significantly lowered the amount of recycled waste by minimising the volume of packaging and recycling on-site. 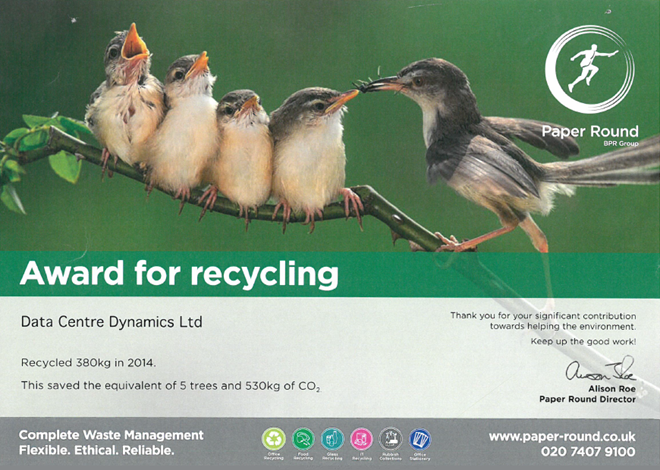 Final report shows DCD recycled 380kg of paper goods (the equivalent of 5 trees and 530kg of CO2. It is the responsibility of DCD and all its employees to reduce electricity and water consumption by 5% relative to 2013/14 levels. We have constantly monitored in our energy usage in order to achieve the lowest emission possible. Manage heating and air conditioning across all offices to ensure the most efficient use of energy. Encourage staff to save energy. Switch off all electrical equipment when not in use. Use all electrical equipment efficiently to minimise energy waste. Shut down the PC overnight and when not in use. Not use personal heaters or fans to remedy a specific heating or cooling problem. Report any heating or lighting fault to Human Resources to help minimise possibility of energy waste. Report any leaks or drips to help prevent unnecessary waste of water. The key obstacle for DCD is to maximise the use of sustainable business travel and to minimise the need for travel. DCD is determined to reduce its business travel costs by 5% relative to 2013-14 levels. Ensure that the need to travel is essential. Book travel as early as possible to maximise cost savings. Always book standard class tickets, wherever this proves the cheapest option. Determine whether business needs can be met by an alternative method such as videoconference or teleconference. Always consider public transport as the first option for business travel.